I already know that I wear my heart on my sleeve; I just wasn’t aware that I also wear every single emotion on my face too. In the fall, my boy will be headed off to kindergarten and today I’m at kindergarten orientation registering him as a new student. I thought I had my emotions in check, but I caught the eye of the principal mere moments of entering the school. Could you sense that I had been punched in the stomach when I pulled up to your lovely little school? Could you see on my face that even though I’m standing in a school that parents and students love, that is surrounded by a neighborhood that people flock to simply to attend your school, a school that has artwork and student achievements wallpapering the walls, that I’m searching hard to find something I don’t like. Could you sense the dull pain in my chest? The pain from realizing that in a few short months I will be putting my heart on a big, yellow bus and I’ll wave and wave until I can’t see him and just like that, he’s off to school. It’s about me all excited and wistful and scared all in one at kindergarten orientation. It’s me chiding myself for being so emotional and knowing my Mom friends will have a field day with me when I recount this ridiculous interaction between you and me. Because, after all, Mrs. Principal, in a few months you and I will see each other in the hallways for parties and PTA meetings, and I can assure you I won’t be crying then. 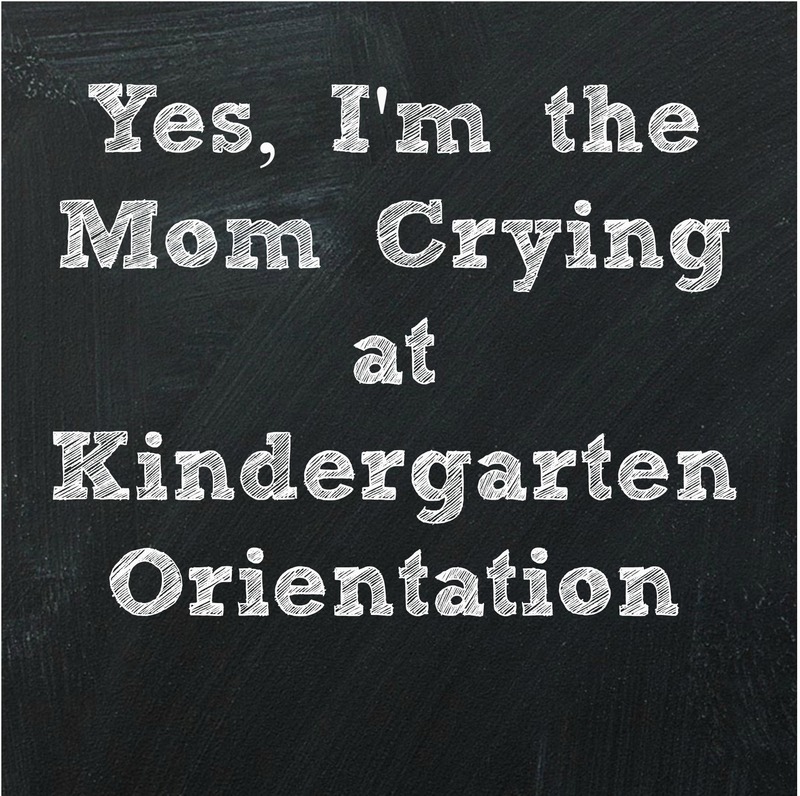 And maybe in a few years, when I make this kindergarten orientation trip for my daughter, I won’t be crying. Probably, I will probably be crying. Goodbye Fast Lane–I’m on Huff Post Parents! My to-do list has about 357 things for me to accomplish today. The only way I am going to get it all done is if I move at warp speed and drink three more cups of coffee. The problem is, I already know I will be slowed down by my boy. 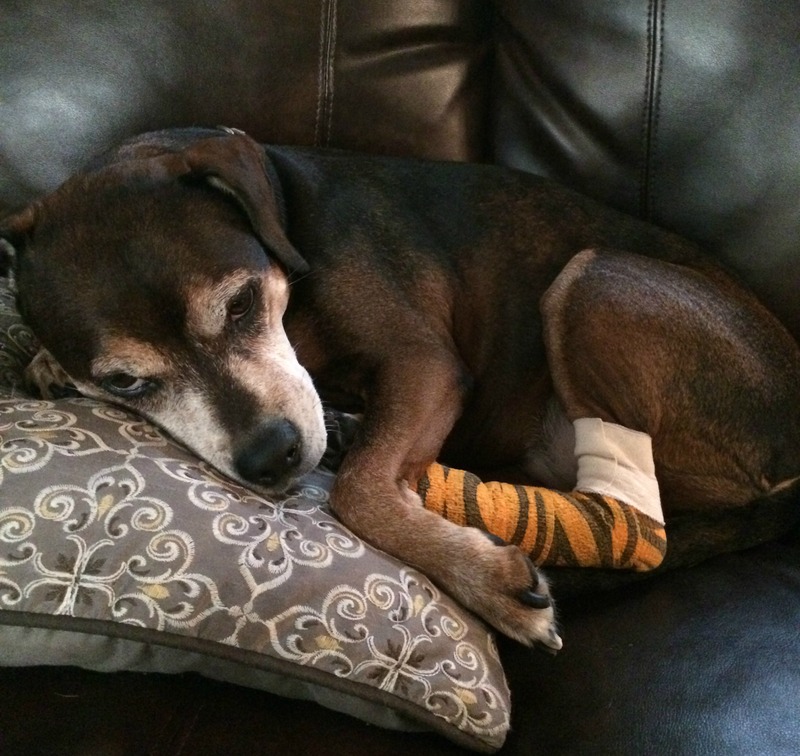 What does a toenail, a car battery, and an expensive vet bill all have in common? Well, friends, that’s exactly what my husband got for the celebration of his birth this year. 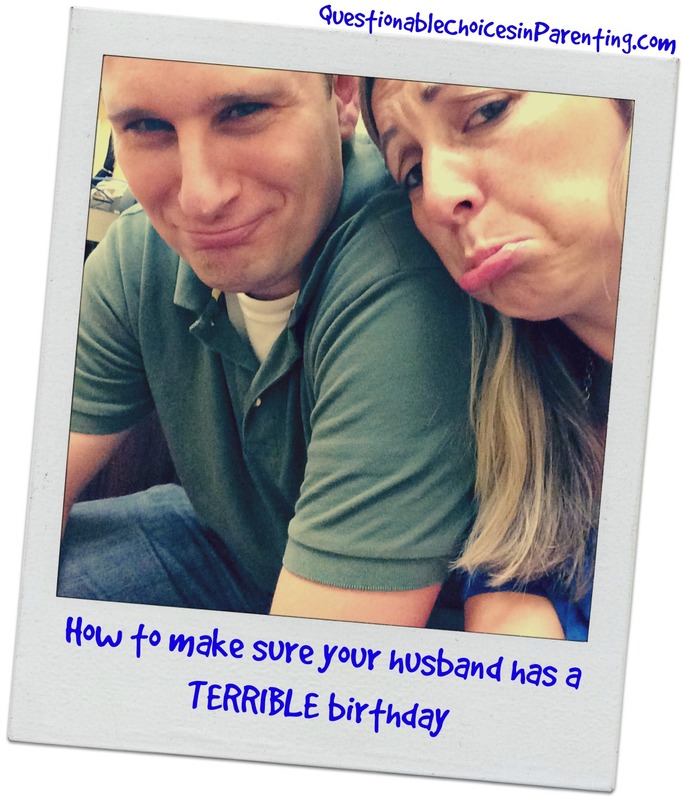 Five minutes before our babysitter was set to show up for my husband’s big birthday date night, I giggled that I was signing his birthday card with a broken crayon and was really feeling guilty that I couldn’t come up with a good gift for him. Eh, at least I had reservations to a fancy new restaurant and would make out with him after dinner. That would totally make up for my crayon scribbled card and lack of an inventive gift, right? You would think after having two kids and several undesirable situations with bodily fluids I could handle this from my dog, but then you would be totally wrong because I was feeling woozy and was going down for the count. My husband had an injured dog in his arms, was blocking kids from the bloody mess with his body, and used his foot to prop me up from sliding down the stairs. And they say men don’t multi-task. Aaron carried a towel wrapped Suggie out to his car and I ran after them clutching tissues and credit cards knowing both would be put to good use at the after hours emergency vet. But I stalled when I opened the door to Aaron’s car. There wasn’t a single goldfish cracker anywhere. How could anything we own not contain at least one goldfish cracker? At this point, I just assumed the kids shed the fish like skin. When I turned the key, the car sputtered and faltered. I tried again. Sputter, sputter, sputter, silence. The battery is dead. The battery in the freaking car is dead. Of course it is. New plan: get into my car, spend a small fortune at the emergency vet, call AAA, spend another small fortune, drink LOTS of wine when we return home. I’ve heard that after a while dogs and their owners start to look alike. 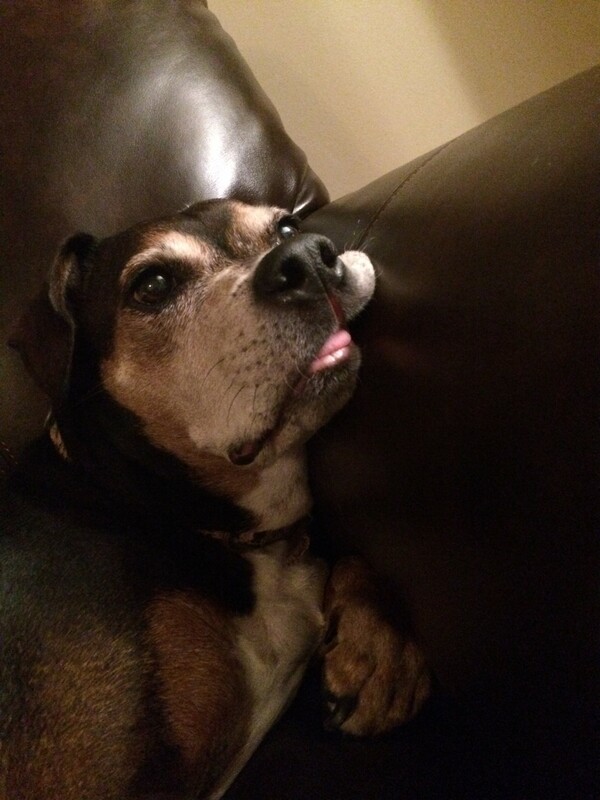 Here is Suggie all hopped up on pain meds. Oddly enough, this is exactly what I look like after drinking a bottle of wine! While waiting for the AAA guy to install a new battery in the middle of the night, I helped myself to the wine I planned on sharing with Aaron. Because nothing says “I love you, birthday boy!” like your wife lulled to sleep on the couch after inhaling a half a bottle of pino grigo. So this birthday celebration was an epic fail, but Suggie is on the mend, I’ve promised Aaron a do-over birthday, and to think, I was worried I wouldn’t have a gift for him. However, there are no returns on the black toe nail and car battery. 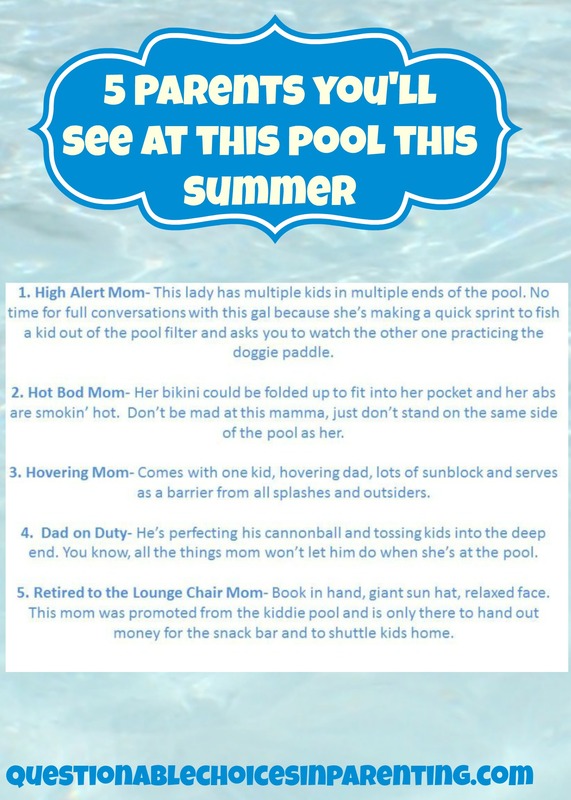 Headed to the pool this summer with your kids? 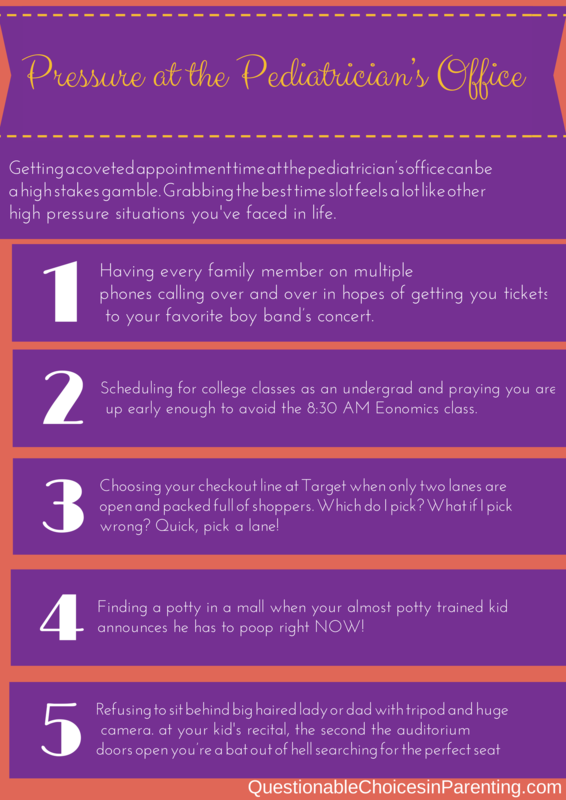 Be on the lookout for these five parents. You’ll see them for sure. I’m #1–how about you? Listen to Your Mother– The Videos are Out! Honestly, I cried and let out a scream that sent the dog racing out of the room (very fitting–you’ll see in the video). Then I panicked. My piece was my usual humor and parenting fail post and so many pieces I had watched online were so heart wrenching and brutally honest. What if my reading didn’t add up to those women sharing such personal stories? My fears of not measuring up were put at ease when the director Stephanie told the cast how each of our stories served the greater purpose of telling an entire story and taking the audience on a ride full of ups and downs, tears and laughter, sympathy and empathy, and the perfect blend of motherhood. I love this show. I love the women in this show with me. I love Stephanie and Kate for choosing me. 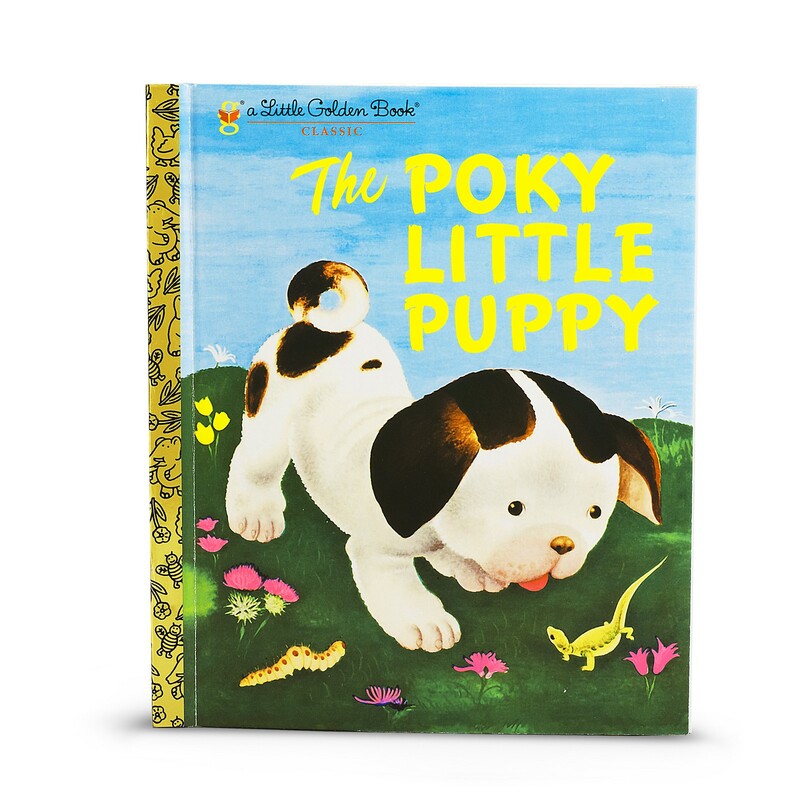 I love this story. And I love that I get to share Listen to Your Mother with you. While you won’t need the tissues for this reading, I hope it makes you laugh and you watch the videos of the DC cast and the other cities!